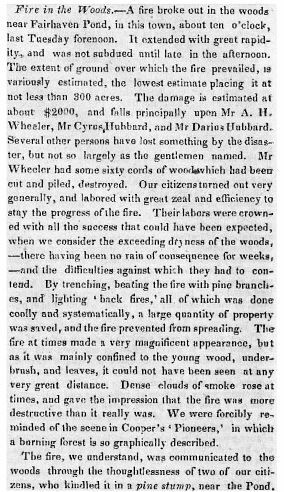 On April 30, 1844, Henry David Thoreau accidentally started a major forest fire in the Concord woods after his campfire got out of control. The fire burned 300 acres of forest and nearly set the town of Concord ablaze. “I once set fire to the woods. Having set out, one April day, to go to the sources of Concord River in a boat with a single companion, meaning to camp on the bank at night or seek a lodging in some neighboring country inn or farmhouse, we took fishing tackle with us that we might fitly procure our food from the stream, Indian-like. At the shoemaker’s near the river, we obtained a match, which we had forgotten. Though it was thus early in the spring, the river was low, for there had not been much rain, and we succeeded in catching a mess of fish sufficient for our dinner before we had left the town, and by the shores of Fair Haven Pond we proceeded to cook them. The earth was uncommonly dry, and our fire, kindled far from the woods in a sunny recess in the hillside on the east of the pond, suddenly caught the dry grass of the previous year which grew about the stump on which it was kindled. We sprang to extinguish it at first with our hands and feet, and then we fought it with a board obtained from the boat, but in a few minutes it was beyond our reach; being on the side of a hill, it spread rapidly upward through the long, dry, wiry grass interspersed with bushes…. Although Thoreau wrote that he did not feel any guilt over his actions, the fact that he was still dwelling on the incident, and the attention he received as a result of it, six years later suggests otherwise. Residents of the town were angry at Thoreau for not only damaging personal property in the fire but also for burning some of the last remaining untouched woodland in an area that had been devastated by deforestation brought on by the industrial revolution. As Thoreau stated in his journal, the residents continued to taunt him years later, calling him the “woods burner” wherever he went. In 2009, Thoreau’s accidental fire was immortalized in a novel by author John Pipkin, titled Woods Burner. 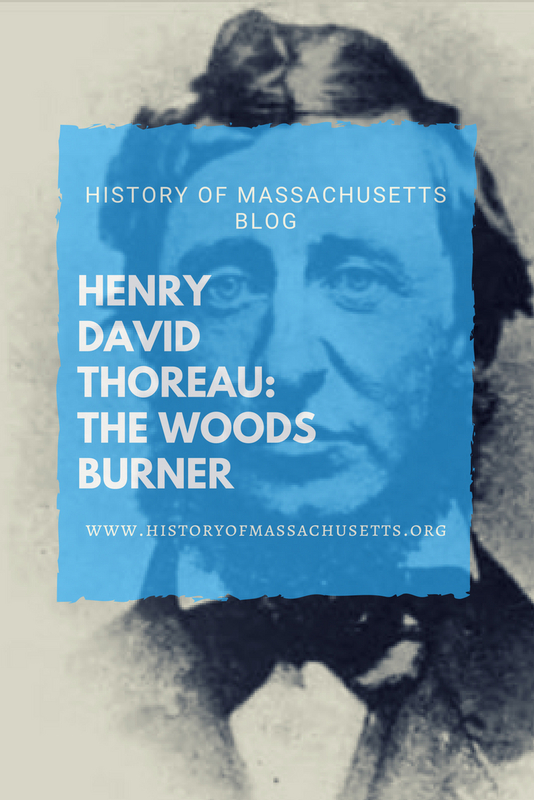 The novel suggests that the fire, and Thoreau’s lingering guilt, may have inspired him to build his cabin at Walden Pond just a year later, where he wrote his famous work, Walden, as a way to repay his debt to nature. This is wonderful!! I enjoyed reading about Mr. Thoreau so much. What an interesting man.!! I was on This web site looking for the college or school that my Grandfather attended when he was a young man living in Northampton. He became a pharmacist and I wondered where he might have gotten that education in 1902. He was born in 1884 and I thought that 1902 would be about the time he would be getting that education! I love History too, so continue to send me more of these articles. Thank you. I am Janet Turner and now living in Texas. Springfield, Ma. was my home town. I look forward to more articles. Thank You!! A very overrated writer who “lived off the land” with lots of financial help from Emerson. I don’t know anyone I know who attended Concord schools who read or cared much about his “work”. You’re entitled to your opinion but I strongly disagree. He’s one of my favorite writers and I care very much about his work. I care very much about Thoreau, but he was clearly only human. This deployment of his immense eloquence and philosophical insight and wisdom in the service of total self-exculpation has always disappointed and mildly alarmed me. Any grievous mistake or crime might be “transcendentalized” away in this fashion, and by refusing to take responsibility and make amends as best he could, Thoreau let down his own best self.